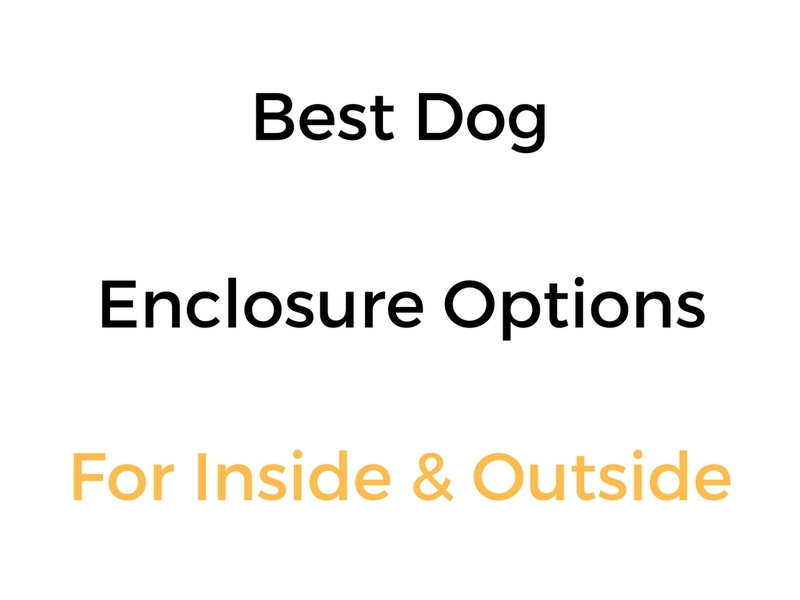 In this guide, we consider the best dog enclosure options for both inside and outside the house. They each come in different sizes with different features and benefits and drawbacks, so one of them is bound to be suitable for your preferences. Let’s check them out in more detail! Everyone knows what a dog crate is. These are usually rectangle crates used for a range of uses such as containment, a bed area, house training, travel/transport and so on. Dog crates come in several different types such as metal, plastic, wooden, heavy duty steel, soft sided and more. They are for inside or outside. You can check out the best dog crates in this guide – Best Dog Crates: Reviews & Buyer’s Guide. Puppy playpens are specifically for puppies and are designed to give a puppy a bit more space to move around in than a crate. They are soft sided so are very lightweight and highly portable. You can usually fit several puppies in the one playpen. They are for inside or outside use. One of the most popular puppy playpens is the EliteField 2 Door Soft Sided Pet Playpen (on Amazon), which is available in up to a 62 inch diameter x 36 inch height size. Dog exercise pens are the adult grown dog version of a puppy playpen, as they are bigger, taller and provide more containment area for bigger dogs. They most commonly come in metal or hardened plastic material. They come standard in 4 panel or 8 panel exercise pen kits. You can expand the containment area by purchasing additional exercise pens and connecting them together with connector rods. They can be used indoor or outdoors. You can check out the best dog exercise pens here – Best Dog Exercise Pens: Reviews & Buyer’s Guide. Dog Gazebos and kennel cages are large outside enclosures. As standard, they usually come with an overhead cover to protect pets from sun and rain. You can usually fit multiple full grown pets in one kennel cage, and some models allow you to connect multiple cages together so pets can run between them. They are primarily for outside use because of their size and weight. You can check out the best dog gazebos and kennel cages in this guide – Best Dog Gazebos & Kennel Cages: Reviews & Buyer’s Guide.